NEC is showing a new single core and dual core ARM Cortex A9 solution running Android. Interview with a Samsung Super AMOLED representative at the Mobile World Congress 2010, explaining why Super AMOLED is better than first generation AMOLED by Samsung. Samsung is probably the first to mass manufacture AMOLED screens. This is a pretty good looking 3D accelerated home replacement using Open GL ES 2.0 hardware acceleration for Android on Texas Instruments based devices. Thunder Soft has customized a version of Android for this Qualcomm Snapdragon based Tablet prototype. Here's Huawei's second generation Mifi adaptor. It connects with up to 21mbit/s on HSPA, it auto-connects to 3G and WiFi on being turned on. Here's a new Motorola Android phone. Huawei is showing this new Android 2.1 based compact smart phone. Orange and Moviestar do not sell SIM cards in store. I am going to try get a Vodaphone one or Yoigo SIM card one for data tomorrow. Upload from the hotel is about 20kb/s, unusable. I expect to find 100mbit/s upload from the press room at the Mobile World Congress and I will start posting my videos then. Today I filmed awesome, amazing demonstration of Opera for Nexus One and saw it on the iPhone. They claim it to be faster than Android web browser and Safari by 6x and it looks very good on their demo units. The Sony-Ericsson X10, X10 mini and X10 mini Pro. HTC HD2 among others. Look forward to all my videos from Mobile World Congress that I will start uploading tomorrow. 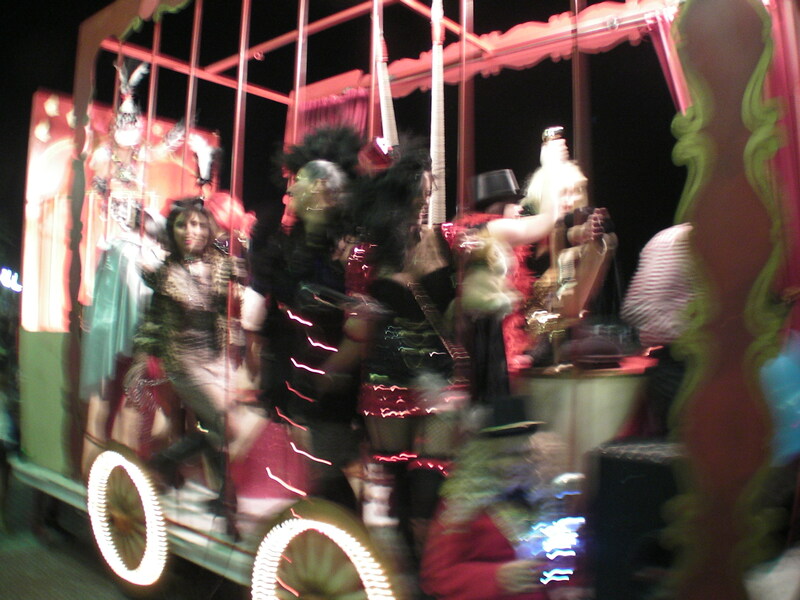 For now, here's a blurry picture from the Carnival in Sitges going on right now outside of my Hotel, I'll upload a video of the carnival as well later when I've got the bandwidth. Olé! I am going to Barcelona for the worlds biggest and most influential conference on Mobile phones, mobile Internet devices and future technology in the mobile world. This is going to be my first Mobile World Congress, so I am really looking forward to it. Please do subscribe to my RSS feed or follow be on http://buzz.google.com/charbax to keep updated with my latest video posts in real-time just as I upload them in HD quality to Youtube and post them here to this blog. If you enjoy any of my videos, please do "Like" them in Google Buzz, please do submit them to influential blogs and other sites so more people watch my best videos. - ARM Cortex A9 powered stuff, I expect Texas Instruments will have awesome demonstrations of this, and for sure more Nvidia and I wonder who else will show this technology. - Nexus Two, Three and Four. What I mean by that are alternatives to HTC in making at least 3.7" WVGA AMOLED, Android 2.1 and 1ghz ARM Cortex A8 or faster smart phones. Those are likely to be on display by manufactures among others that are Samsung, Motorola, Acer. - ARM Powered laptops are getting even closer to worldwide release. I would like to film more demonstrations of awesome looking Android laptops like the HP Airlife 100, Quanta manufactured prototypes, Marvell reference design prototypes and many more. It would be nice to see some of them run smooth Google Chromium OS and fast and smooth web browsers. - May this be a perfect opportunity for big manufacturers to officially announce and launch Pixel Qi screens in new Laptop and Tablet form factors at affordable prices and with amazingly long batterz runtimes. - I expect to see huge things from Google and from all the Open Handset Alliance and ARM Solutions Center for Andriod providing new amazing hardware acceleration solution in new software updates, demonstrating next generation Android solutions, showing more high resolution large screened Android solutions. - Chrome OS demos, show those. Anything that is ARM Powered and that runs Chrome OS smoothly will be very interesting to see and interview software engineers about the status of running a full speed Chrome browser on ARM devices, what they plan to do and how soon it will be released and for how much. Can they run unlimited amounts of tabs on a $150 ARM Powered laptop with only 128MB RAM inside? - How cheap can the cheapest Android phones be at this point? Will we see huge amounts of new manufacturers from around the world demonstrate cheaper Android phones and that still perform pretty well? Can we see $100 unlocked Android phones already, or at least below pointing at well below $200? Please do contact me or post comments here if you hear about any specific awesome ARM Powered devices that I should film at the Mobile World Congress, I will try to film all the requests that I get in comments, by email and to my Google Buzz threads.